I wore this dress to our tea ceremony in Shanghai the day before our wedding. 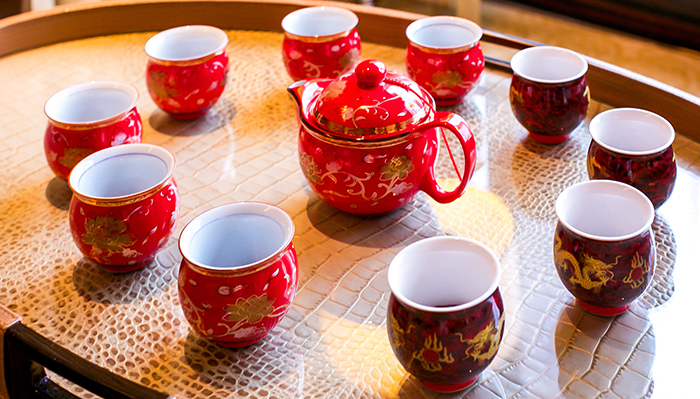 The tea ceremony is a significant part of a Chinese wedding to pay respect to parents and elder family members. I'm so grateful for everything that my parents have done for me. I decided not to wear something traditional. Since red is such a great color for weddings and for good luck in Chinese culture, I picked this red lace dress for our tea ceremony. I figured I will be able to wear this dress more for other occasions like date nights, wedding guest and Chinese New Year etc. These Nina shoes and clutch are just perfect for weddings especially these heels. Nina has awesome bridal collections. As you can see, they are not high, are super soft and comfy. I also wore this outfit out to dinner and drinks with friends the night before our wedding in Shanghai. Such gorgeous photos! You look amazing. You look absolutely stunning! That dress is a showstopper! Amazing look! The shoes looks nice! This red dress looks amazing on you!